Looking for an elegant but easy side dish to make for your next dinner party or Sunday dinner? 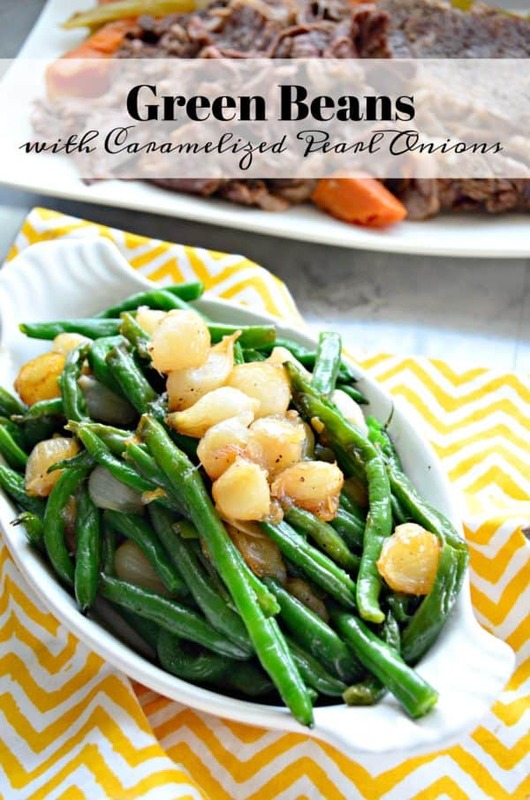 Try my recipe for Green Beans with Caramelized Pearl Onions. I’m always looking for new side dishes to make my family. I feel like I make the same old roasted broccoli, grilled asparagus, or even buttered corn. I made a new recipe last month that required caramelizing pearl onions. For our Sunday dinner the other week, I made a pot roast in the Instant Pot (that recipe will be posted soon) and had some green beans I wanted to serve on the side. Normally, I would just roast the green beans or even a simple saute. But this time around I wanted to do something more with them. That’s when I had the idea to incorporate the caramelized pearl onions with green beans. I grew up eating peas with pearl onions but never with green beans. I figured the two vegetables would marry well together and oh my gosh did they ever! This side dish comes together in about a half hours time. The first step is caramelizing the pearl onions. I use a bag of frozen pearl onions. A little oil in a saute pan plus the frozen pearl onions and granulated sugar are all you need to get the process started. I also like to sweat the onions by using a lid to really help keep all the liquid inside the saute pan. The key is to cook it low and slow for a good 15 minutes. I will even add a little water to the saute pan. Then once the onions are brown and caramelized that’s when I add in the green beans. You can cook the green beans as little or as long as you would like. My family is not a fan of al dente green beans so I cook them a little longer. They like them soft so that’s how I make them. But if you like them al dente then you can reduce the green bean cooking time. Even my onion hating husband loved this side dish and I’m pretty sure I’ll always be making this side dish with my Pot Roast or any other big Sunday meal where I want a “fancier” side dish then a steamed or roasted vegetable. I’m also putting this recipe in my back pocket for Easter dinner. Yes–I’m already thinking Easter and yet Valentine’s Day is less than a month away. This is sadly how my brain works. I’m always thinking about the future and planning for the future. 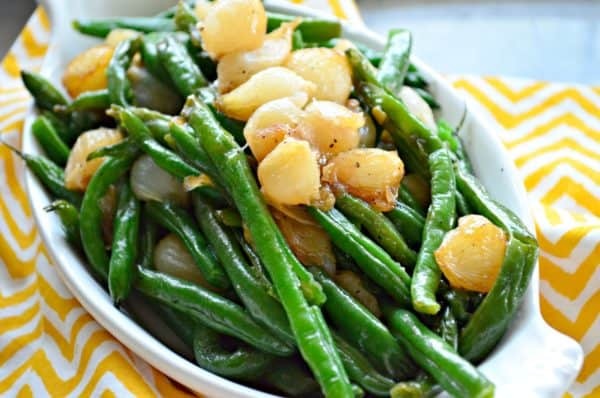 If your look for a delicious and easy side to wow guest then you definitely must try my recipe for Green Beans with Caramelized Pearl Onions. In a large saute pan fitted with a lid, pour the olive oil in the pan and heat on medium-high heat. Then add the frozen pearl onions and the water. Sprinkle the sugar on top of the onions. Stir, place lid on top of saute pan, and reduce heat to medium-low. Cook for 15 minutes until onions begin to caramelize (stir every few minutes as needed). Once the onions are golden and caramelized move the onions to the edge of the pan. Place the green beans in the center and season with salt and pepper (I use about 1/4 teaspoon salt and a pinch of black pepper). Place the lid on the pan and cook for 10 minutes (stirring often and add a little water in the pan if needed). Once the green beans are cooked, divide evenly among plates and enjoy.